Energy Drinks and Dental Health What is gum disease? Oral hygiene has always been an important part of maintaining overall health. For thousands of years, humans have found ways to keep their teeth and mouths clean. According to the American Dental Association (ADA), “early forms of the toothbrush have existed for nearly 5,000 years.” But what exactly did the first toothbrush look like? 3000 BC – Perhaps the earliest form of the toothbrush, the “chew stick” was used by Ancient civilizations. People would rub this thin twig with a frayed end against their teeth to remove food and plaque. 1498 – The bristle toothbrush was invented in China and had many similarities to the toothbrushes used today. These devices were made by attaching the stiff, coarse hairs from the back of a hog’s neck to handles that were typically made from bone or bamboo. 1938 – Signaling the end of the boar bristle, Dupont de Nemours introduced nylon bristles, and Americans welcomed Doctor West’s Miracle Toothbrush, the first nylon toothbrush. 1960 – The Squibb Company introduced Broxodent, one of the first electric toothbrushes, to the American market. 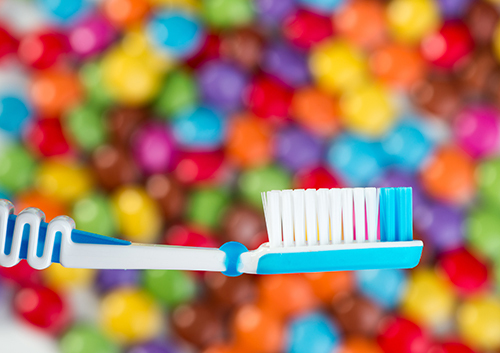 Today, there are many brands of toothbrushes that often advertise different benefits. The variety of options may seem overwhelming, but the most important thing is for you to find a toothbrush that you like and find easy to use. The ADA recommends that you choose a toothbrush that fits comfortably and allows you to effectively reach all areas of your mouth. Whether you decide to use a manual or a powered toothbrush, make sure that you thoroughly clean all surfaces of your teeth twice a day. Society has come a long way since the days of the chew stick, but one thing that remains the same is the importance of consistent and effective personal oral hygiene.